Will The Next Mazda 6 Will Go Rear-Wheel Drive? Thanks to a partnership with Toyota, Mazda will finally make a cool sedan. The Mazda 6 is one of our favorite midsize sedans, but it lacks the power that we crave as enthusiasts. Mazda does know how to deliver a fun car, but the 184-hp FWD drivetrain of the 6 has always left us wanting more. We've heard plenty of rumors regarding a turbocharged Mazda 6, but Mazda has quashed them all. We know that the company's 2.5-liter turbo Skyactiv engine would fit in the car, but Mazda has simply been stubborn on this issue. Now a new rumor from Japanese site Car Sensor indicates that we could see a RWD Mazda 6. The rumor is based around Mazda's new partnership with Toyota to develop a new infotainment system, build a factory in the US, and create a Tesla Model 3 fighter. Mazda and Toyota will join forces to create a new FR platform that is rumored to underpin the RX-9 sports car. The rumor claims that the next generation Mazda Atenza (which is what the 6 is badged as in Japan) will share the RX-9's FR platform. Toyota's cars that use the FR platform include RWD models like the Japan-only Toyota Crown and the Lexus IS. As much as we would love to see the Mazda 6 go RWD, we have to question this rumor's validity. Rumors from Japanese websites have had some truth to them in the past, so we can't simply brush this off completely. However, we find it hard to believe that Mazda would suddenly decide to be fun by building a RWD Mazda 6. Mazda has been extremely difficult to predict and hasn't given us much information in regards to faster models. 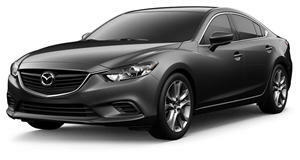 We predict that the next Mazda 6 will be based on the updated Mazda 3, which is set to arrive for the 2019 model year with Mazda's revolutionary sparkless gasoline engine. That means the 6 would keep its FWD, and likely just gain efficiency. We keep hoping that Mazda will build a true sport sedan, but so far we have been disappointed.